Library Advocate. : Decorative Wood Book "Shelves"
Several years ago, a library conference exhibitor promoted a fundraising program where supporters would buy a wood book spine with their name on it, and the collection of big and small, variously colored book spines would evenually go on a library wall. I loved the idea at the time and just remembered it, so went searching online. I'm getting close. In the meantime, here is a fun fake book shelf that caught my fancy. Worthington Library Book Panels are decorative wood book spines in a wood book case. There are 3 models. The website says the 'shelves' can be used to disguise a door or secret passageway! Sounds fun. Another decorative or "faux" book shelf company is The Dummy Book Company. 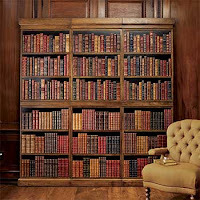 According to their website, "Our faux book products have graced everything from television and movie studios to the finest homes, hotels, yachts and restaurants. We have been featured in numerous magazine and print media publications." This might be a good way to upgrade an eggshell painted wall or walls of a meeting room. NOTE: Item added to hotlist, Gift Guide for Library Lovers.